Add Oikos Greek yogurt to your favourite recipes to get that dreamy creamy comforting flavour. Plus, it’s a simple way to get a protein boost. 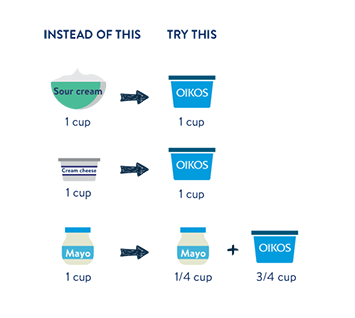 See how easily you can swap oil, mayo, cream, and more for your favourite yogurt by checking out our swap chart.